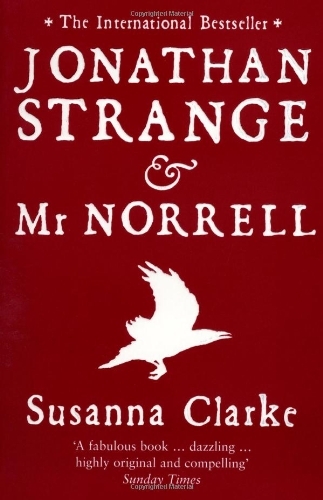 Over the last few years, a number of friends have mentioned the book Jonathan Strange & Mr Norrell to me and been surprised that I haven’t read it. Written in 2004, Susanna Clarke’s international bestseller has after all been around quite a while now. It’s one of those books I’ve always meant to read and just never got round to picking up. In the meantime, fans of the book have been desperate for a screen adaptation and after possible film projects have come and gone, the BBC have finally completed a seven part adaptation of the story for BBC One. It will air some time in May (no specifics yet) and last night I went along to the BFI’s preview screening of episodes one and two and what a truly outstanding piece of drama it is. For the uninitiated, the story is set at the beginning of the 19th century, when magic has not been performed in England for over 300 years and therefore the country has lost its belief in such practices. However, in Yorkshire, a reclusive man is in fact a practical magician and on being pressed to prove so, causes quite a stir when he brings the statues of York Cathedral to life and speak. With his newfound celebrity (which he is not too keen on), he travels to London on the encouragement of his man of business, hoping his talents can be useful to the government in the Napoleonic Wars with France. While there however his summoning of a fairy (and not the nice type you are thinking of) causes all types of problems to begin. At the same time, wealthy gentleman Jonathan Strange is not even aware he is capable of magic, until a street magician, Vinculus, tells him it is his destiny. Soon Norrell isn’t the only magician in London. It sounds fantastical, which of course any drama about magic will be. However, don’t be put off if that isn’t something you normally turn on your television for. If you enjoy top quality drama of any kind, you will enjoy this series. As a story, I was impressed by how credible and real the world on screen is. Susannah Clarke was very clever to set her story in period England, during a historical war we all know about, with the magical elements simply weaving in as if they’ve always been there. This gives it an authentic reality that you don’t find with all fantasy stories. As a drama I absolutely loved the opening two episodes, which I imagine will only get better as the story unfolds. Episode one sets the scene, introduces the main characters and draws the audience in to the story very quickly, while episode two builds on the story and mood and contains some of the first brilliant visual effects moments. As someone yet to read the book, the world was new to me, but you certainly don’t need to worry about needing any background knowledge to watch the series and Peter Harness’s scripts are perfectly paced and certainly not confusing. Those around me in the audience who have been fans of the book for years only had praise for his adaptation. Together with director Toby Haynes (whose previous work includes Doctor Who and Sherlock) and producer Nick Hirschkorn, the three have done a fantastic job in capturing the mood and atmosphere of the story and bringing it to life so fully on the screen. It is in equal measure creepy, funny, dark, exciting and intriguing and the visual effects (created by Milk Visual Effects), are incredible. The fact they are not used excessively makes them stand out at moments when you really need them to. Look out for a scene in episode two, which would not be out of place in a Tolkien film and which was so visually impressive, I wanted to applaud (for book readers, it involves a ship and some sand…). I imagine there will be lots more moments like that to come too. 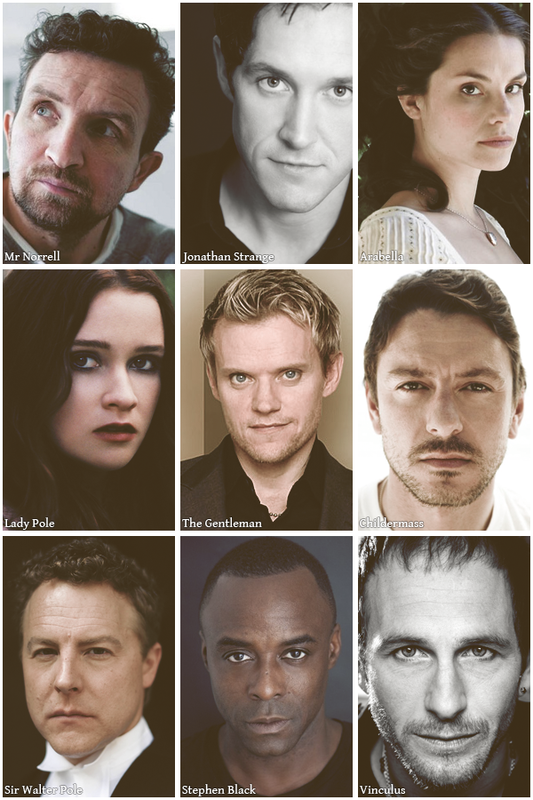 As for the cast, they are simply brilliant. Eddie Marsan is wonderful as Mr Norrell, reluctant to come out from behind his books and interact with others and Eddie conveys his quietness and awkwardness wonderfully. Bertie Carvel (recently seen in Coalition as Nick Clegg, but who will always be the original stage Miss Trunchball in Matilda for me!) is a fantastic choice for Jonathan Strange, who despite his slightly arrogant gentleman persona, is incredibly likeable and Carvel brings out his warmth, wit and humour through his performance. There are some excellent supporting performances too, particularly Paul Kaye (another Matilda veteran) as creepy street magician Vinculus, Enzo Cilenti as Norrell’s man of business Childermass (who seems at times to be the boss of Norrell), Charlotte Riley as Jonathan’s love Arabella, Sam West as Sir Walter Pole, who becomes caught up in Norrell’s magic, both knowingly and unknowingly and John Heffernan, bringing added comedic moments as Lascelles. However, the stand out performance for me was that of Marc Warren (Hustle, The Musketeers) as the fairy summoned by Norrell, named The Gentleman with the Thistle-Down Hair. This isn’t one of the cute fairies at the bottom of the garden we think of now. Instead The Gentleman is a creepy, gothic creation who, once summoned, glides in and out of our world for his own enjoyment, regardless of the consequences and Marc’s performance is superb. Everything from the voice and movement to his look, for which makeup, hair and costume should be applauded, is absolutely perfect. It’s a disturbing and chilling performance (think Bowie’s role in Labyrinth, but much, much darker and far more creepy). I almost wish no promotional images of him appear in advance, so that the first time you see him is on screen as he appears by magic. Following last night’s screening, there was a Q&A session with writer Peter Harness, director Toby Haynes, producer Nick Hirschkorn and actors Bertie Carvel and Marc Warren. 1. What was the journey of the adaptation from book to screen? 2. How did Marc and Bertie hear about the project and get their roles? Marc Warren admitted that he hadn’t read the book, but had seen the cover in shops over the years. He told a brilliant anecdote that it was while in South Africa and chatting to Richard & Judy, that Judy said it was their favourite book and that if it was ever made then he needed to play The Gentleman with the Thistle-Down Hair! When he heard about the project, they didn’t seem to be asking for people to come in for that role (he jokingly said he assumed they had some famous American in mind!) and so he told his agent that he wanted to read for it. In advance of his audition, he learnt a spell (a sigil apparently) and performed his trick when he met Toby Haynes, saying he was The Gentleman! Toby noted how remarkable his casting session was, as instead of lasting the usual 20 or so minutes, he spent 90 minutes doing various scenes with Marc. Bertie had read the book after having it recommended to him and had loved it. He spoke about always casting himself in his head as Jonathan Strange as he felt a kinship with the protagonist and because it was such an incredible story. He loves that the story (and these scripts) keep surprising you, as he is a character coming of age and growing up, but then once you think he’s arrived, the tide recedes and just keeps going somewhere else. He was in New York, opening the RSC’s Matilda at the time of casting and he was shocked when his agent told him they wanted him to tape for the role. Not long afterwards Toby and Nick flew out and worked through some scenes with him before he was offered the part. 3. How did they decide when to use visual effects? Director, Toby Harness, spoke about how this was not the same budget as for that of a film, so there were financial considerations needed when deciding on visual effects. Also due to the size and scale of the book, they needed to keep asking themselves does the effect warrant the screen time, which again is limited and this all forced them to be cleverer. He commented that such constraints were after all how the TARDIS came to be in Doctor Who, which is now so iconic! He explained that they used the effects budget as little as possible, so when it was used the effects on screen would be different to others on television (Marc loved the same scene as me, saying it’s one of the best things he’s ever seen on TV!). Bertie Carvel commented that the magic was often off stage in the story, which makes it seem much more credible as a result. He also liked the “low fi” tricks used for some of the magic, such as summoning Marc’s character (done by lighting a candle), where there is no camera trickery at all, or the scenes when only certain characters can see Marc. This he said was more like theatre, using a collective imagination, which is a kind of magic in itself. The writer spoke of how creating and writing the magic was like creating the atomic bomb – terrible and unpredictable power, which once out of the box can’t be put back in. 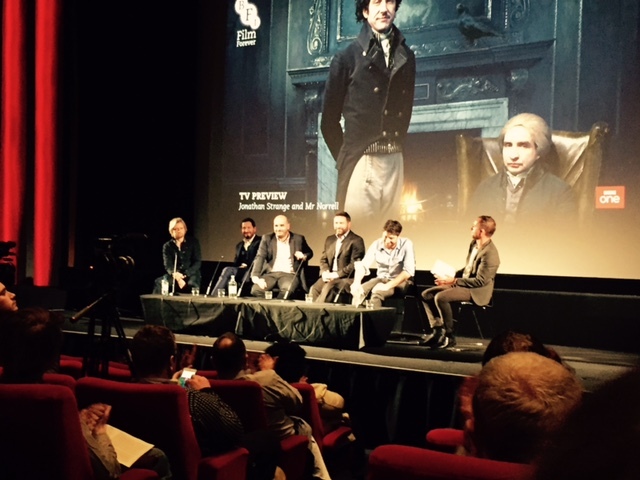 L-R: Marc Warren; Bertie Carvel; Peter Harness; Nick Hirschkorn & Toby Haynes at the BFI last night. 4. How did they go about making it feel like a bigger canvas than it is (in terms of backstory of the world in the book)? Peter Harness spoke of his awareness that people will be turned off if something is too dependent on mythology and how alienating that can be. Therefore the mythological world of the Raven King and the golden age of magic, referred to in the book are there as texture and to give a sense of a bigger world, but that you don’t need an understanding of it to follow the story in the series. They didn’t want that to overpower the story of the characters. 5. Was there an obsession with period detail? The panel spoke about the brilliant work of designer David Roger, which made this easy. They wanted to start from the real world, making is raw and grubby (which apparently is actually quite hard to convey on a set!). The producer said that he felt the key with fantasy is that you have to believe the world and therefore need everything to be consistent in terms of look. He particularly loved The Gentleman’s kingdom of Lost Hope, which he thought looked seamless, as everything worked together to create the consistent look they wanted. Bertie Carvel also commented on the importance of good leadership in a project, but also that he loved that they’d been allowed room to bring everything they could as actors, which he said was rare. 6. How closely did Peter Harness work with author Susanna Clarke on his scripts? Peter explained that they didn’t work closely initially, as she trusted them to get on with it. Toby Haynes recalled that she did send them a letter beforehand which said “Beware of working with magicians. They are extremely ungrateful.” Once the scripts had been developed and ready to be shared she read them and loved them and was very happy and supportive. She apparently became a regular and proud presence on set. 7. Do the panel believe in practical magic and its future in England? Marc Warren said the only magic he can do is make a coin disappear, but that it had been magical making the series! Tony Haynes jokingly said that they were the charlatans so were the wrong people to ask but they all agreed that there had been something special about the project and that everything seemed to slot in to place. 8. Is there an air date? All they could say was that they had been told some time in May. 9. Would they consider adapting Susanna Clarke’s short stories? The producer agreed that the short stories from The Ladies of Grace Adieu and Other Stories were brilliant, but didn’t lend themselves to a long adaptation like this one. He said to wait and see, but that there were no plans to do so at the moment. 10. How useful is it to depict magic in a setting which already has rules you need to follow, i.e. the period drama setting? Bertie Carvel spoke about how Susanna had made a believable world out of the fantastic, by laying it over something very real and that making it believable was the key. The writer agreed that the rules of a period drama were quite clear, so you did have something to start with, although the director did jokingly say that those rules could be a pain too (e.g. how to correctly pick up a spoon in 19th century England)! 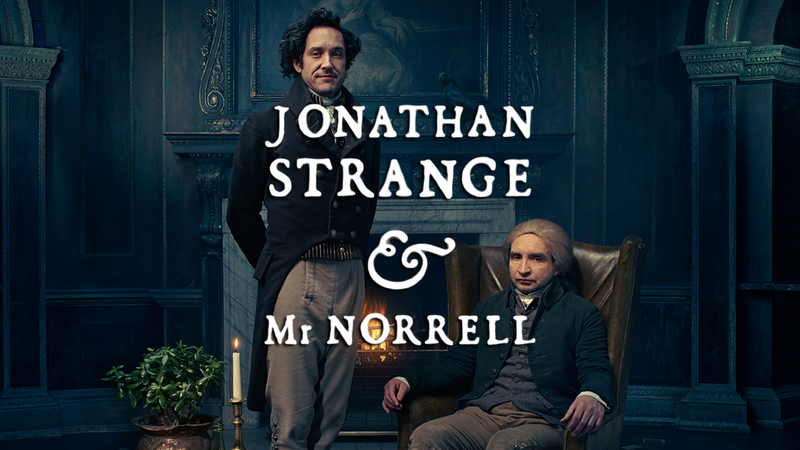 Jonathan Strange & Mr Norrell will air some time in May on BBC One in the UK. For more information keep on eye on the BBC website.